HUNTINGTON BEACH –Hodgdon-Miank Construction, Inc. announced that it has completed phase one of a major renovation of the Pierside Pavilion, a four-level retail, dining, and office complex. With a panoramic ocean view and just steps from the beach, Pierside Pavilion is located at 300 Pacific Coast Highway in downtown Huntington Beach, Calif. The $2 million renovation converted the former Mann 6 Theatre into 33,049 square feet of multi-use Class “A” office and restaurant space. Phase two, which will commence shortly, will consist of extensive tenant improvements for new tenants Grupo Gallegos, an award-winning advertising agency, and a live entertainment venue. As part of the first phase, Hodgdon-Miank Construction performed extensive interior and exterior modifications to the mixed-use center, and renovated a two-level, 118,790-square-foot subterranean parking structure. To accommodate the re-use, the building required considerable structural upgrades on all four levels, including additional brace frames, column strengthening, enlarged footings and removal of a majority of the original theater floors to meet the new design load. Approximately 6,200 square feet of mezzanine was added for additional office space. “In my 46 years in construction, this was one of the most complex structural upgrades that I have been a part of,” said David Miank, executive vice president of Hodgdon-Miank Construction. A unique approach was used to level the original sloped theater floors and stadium seating using structural foam to reduce the design load, which was topped with light-weight concrete. Sixteen new energy-efficient 12 foot wide by 24 foot high windows were added to the exterior facade along three sides of the building to provide natural light to the newly created office space. Hodgdon-Miank Construction worked closely with Eco Barnes Design Group, Ficcadenti & Waggoner structural engineers, and the City of Huntington Beach, and provided design-build services while overseeing all aspects of construction for the conversion. Also, at the Pierside Pavilion, Hodgdon-Miank Construction completed tenant improvements for International retailer Havaianas, which opened its first U.S. location in late June 2010. 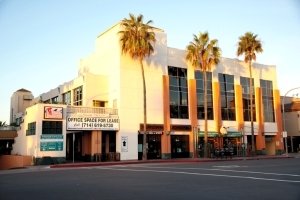 The 86,257-square-foot, four-story multi-tenant mixed-use complex is located directly across from the Huntington Beach pier and sits on the southeast corner of Pacific Coast Highway and Main Street in downtown Huntington Beach. Pierside Pavilion contains popular restaurants like Spark Woodfire Grill, Fred’s Mexican Cafe, and Gallagher’s Pub & Grill, as well as Huntington Surf & Sport, and various office tenants.